If one looks hard enough past the big movie multiplexes, you can still find small art houses and festivals willing to screen indie films, documentaries, and foreign imports. The Irvington Town Hall Theater in Irvington, NY has been doing just that for the past 5 years -- offering an array of wonderful films in the small village along the Hudson River. On Wed, May 21 at 8p.m. they will end their 5th season with a screening of the documentary Elaine Stritch: Shoot Me that follows the incredible actress known for film, Broadway and more recently from the TV show "30 Rock". I was able to speak to the woman behind that film and I don't mean the source of the documentary. I mean the mutli-talented filmmaker Chiemi Karasawa whose film made the festival circuit last year and now has screenings across the U.S. The director/producer will be in attendance in Irvington on the 21st and I wanted to dig deeper to learn more about the person behind the camera. Gregory Allen: You have been in the film industry for over 20 years, what made you decide this was the life for you? Chiemi Karasawa: That's an interesting question! I think it has to do with a love of adventure and storytelling. My career began in feature films, as an assistant to a Producer, and then as a Script Supervisor. We were always shooting in fantastic locations, with diverse and talented people both in front of and behind the camera. The idea of getting together and making a film from start to finish is a bit like joining the circus, except at the end there is this finished film that goes out into the world. I can't think of anything more rewarding than that. Filmmaking is not a job, it's a lifestyle -- a challenging one, but it's a relationship to something that is constantly expanding your life in some way. Allen: Love that! "A lifestyle". Many people do not understand what a script supervisor does, yet anyone looking at your IMDB page will find that next to your name on major films such as High Fidelity, Adaptation, The Taking of Pelham 123, and The Spitfire Grill - just to name a few. Can you enlighten us a little on that position? Karasawa: Script Supervising is a position I wouldn't wish on my greatest enemy, and yet if you can handle all the meticulous and stressful responsibilities, you will have a great vantage point to the craft of Directing, Cinematography, Acting and Producing. A Script Supervisor is basically in charge of maintaining details involved in translating the story to the screen through Editorial notes - creating the blueprints for editing the film together based on the way it has been shot, noting the Director's preference for takes and any other discretions, cuing the actors on lines and blocking, maintaining camera and sound details, maintaining a master continuity log of the film. In a sense, you're the Director's right hand, along with an AD. It's a lot of responsibility, and little recognition. But you gain valuable relationships and experiences, and the exposure to the shooting process, and the translation from story to screen, is infinite. Allen: I recently returned from a film festival down the shore in NJ and was impressed with the documentary shorts that I saw, yet too many times filmmakers shy away from documentaries. (As do some film goers.) You embraced it head on in 2005 when you started Isotope Films which has been very successful in getting non-fiction into the world. What was the significance/importance of founding this film company? Karasawa: I didn't really know my company would focus on documentaries and true stories until I realized how much time it takes to raise the money for narrative films, attach actors, wait for schedules to align, etc. My first documentary, Billy the Kid, was comparatively easy compared to the struggle of financing and scheduling a narrative film. And once that film did well, I continued to get hired on documentary projects - it seemed everyone I knew had a doc in their back pocket they were trying to get made. So I feel fortunate that my career has taken that route, but I love storytelling in all forms. But I do find true stories particularly appealing and inspiring, generally more entertaining than anything someone can make up. Allen: As someone currently in my own fundraising campaign for a narrative film - I feel your pain. How did working with some amazing directors such as Spike Jonze, Sam Mendes, and Martin Scorsese assist you in entering that position with your documentary Elaine Stritch: Shoot Me? Karasawa: All the experiences that I've had working with directors have been a valuable education for me, and I've worked with both Spike and Marty on their own documentaries as well. All the directors you mention, in particular, all have a visceral passion for storytelling. They are tireless when it comes to what they want to achieve and that energy is inspiring. Allen: As someone who has made non-fiction stories her life as a producer for almost ten years, what was it about Ms. Stritch that made you know "I want her life to be my directorial debut"? Karasawa: It was actually Elaine's idea. I didn't know if financing would be viable as a first-time director. When I had the conversation with Elaine, she basically said "I don't want to deal with anyone else - why can't you just do it?" I was both relieved and nervous, but I did it and I'm so glad I did. I think the film was able to be much more intimate because of our relationship at that stage, and I have her to thank for making that opportunity possible. Allen: She has had such a varied and wonderful career in film, TV and stage - have you always been a fan of her in those different genres? Karasawa: I came very late to that party. I only had a very cursory knowledge of Elaine's work when we met at my hair salon on 57th Street. I knew "30 Rock" and I worked with her briefly on Romance and Cigarettes when she was cast as Jim Gandolfini's mother. It was really Piet (hairstylist at Vartali) who suggested that I make a film about her after making the introduction. I was initially intrigued, but when I researched her at the NYPL video archive, then Googled and YouTub'ed her, I was blown away. It wasn't only her performances that impressed me, it was what I gleaned from her appearances on TV talk shows, and her personal life. She was a force of nature, and I couldn't wait to expose more people to who she was - not only in the theater, but in life. She has incredible vitality and courage, and as someone who is unique in every way, a true role model. Allen: As a documentary filmmaker, you are keeping a distance from your subject and yet always there. 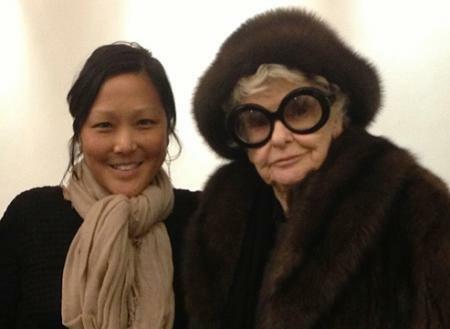 In the end, do you feel you created a deeper relationship with Elaine Stritch? Karasawa: Absolutely! You cannot spend 2 years following someone throughout their day-to-day life, on the road, and not have a "deeper" relationship with them unless you are robot. Elaine demands that of anyone who spends time with her. We became very close throughout the filming, I was going through many things in my life and she was a great friend to me. I am still in touch with her and have visited her in Birmingham many times. She is so many things to me, it's tough to explain, but the way our relationship evolved is well represented in the film. I think the success of this film has a lot to do with access, and I was fortunate to be given a lot of access to Elaine because she encouraged it. Allen: I personally think it's wonderful because you are expanding the audience of documentaries as there are many that will see your film because they know of her as a stage actress or others that fell in love with her on "30 Rock." Do you think your next directing project will be another documentary or will you return to the world of narrative film? Karasawa: I'm unbiased, I'm interested in any great story that is worth bringing into the world. Currently, I have several projects on the burner, and one of them is a true story that is being developed into a narrative film, so I guess you can say I've come full circle!